Supplies: We will provide the following items for your foster husky, but please let us know if you are happy to provide any of these supplies. Food & water bowls: Have separate bowls for your foster husky. Feed your resident dogs & foster husky separately so that they can eat in a stress-free environment as they are getting to know each other. Food: ARA can sometimes supply treats too depending on our receipt of donations. Dog Crate: We strongly recommend you have a crate for your foster husky. Crate training is a very helpful way to introduce a dog into a new home. We can give you instructions on crate training if you are unfamiliar with it. Toys: Kongs are excellent for stuffing— they will keep your foster husky occupied, especially while you are away from the house. Stuffed toys or balls are also great, depending on your dogʼs temperament. The black ones are the toughest to destroy! Bed: Cotton blankets or large beach towels are best as they are washable and less likely to be chewed up by your foster husky. 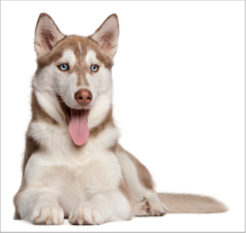 Collar & leash: We will provide a collar and leash for your foster husky. An ARA ID tag will be on your fosterʼs collar as well. This collar and tag should stay on at all times. Flea Treatment: We ask you to keep track of applications and be sure to apply it monthly. Introduce your resident dogs to your new dog on neutral territory, at a park for example. Introduce them on leash, with an adult holding each leash. Allow a quick “hello” sniff or walk-by, and then separate them, even if things seem fine. This gives them a chance to think about things, and often, they will then seek each other out to get a lengthier greeting. Taking both dogs on a brisk walk together is often a good idea. An extended ‘nose to nose’ meeting while both dogs are on a leash is NOT advisable. Give plenty of positive reinforcement so that both dogs feel safe and that the other dog is a friend, not a foe. If one dog gets aggressive, separate them quickly and slow down the pace of the introductions. Don’t force things if they are not immediate best friends, sometimes it takes a few days for dogs to accept each other. Sometimes, dogs just don’t like each other. By giving them each attention separately, and making them feel safe about their bed, toys, and food, you can minimize any tension. Set them up for success and limit anything that could cause the dogs to fight…bones on the floor, or toys etc. Dogs are pack animals. There is usually one who dominates. Correction of one dog by another (whether it is your resident dog or the new one) is normal. As long as the dogs are responding positively to each other and seem to recognize the “pecking order” this is fine. So, one dog may growl at another. If the dog reacts by moving away or showing passivity, then usually, the dogs will get along fine. If they are constantly battling for the “alpha” position, then they will have to be separated, and may not be a good fit for each other. Never leave the dogs unsupervised together. They are still getting to know one another, and will need correction on appropriate behavior toward each other, which means supervision. If you are leaving the house, then crate the dogs or otherwise physically separate them. If possible, it is best to keep your dogs separate from each other for the first 2 days. This is a stressful time for the rescue dog who may have been on the street, in the shelter or in a transition foster home before arriving at your house—a lot of change for an animal that likes to have a “pack” and some stability in his/her life! Also, there are some common sicknesses that sometimes don’t show up for 1-2 weeks that dogs often get at the shelter, so separation can ensure that your dogs don’t get sick. If it is not possible to keep them separate, be aware that your dogs may be exposed to illness. However, also be aware that many of the diseases that shelter dogs get (Kennel Cough, Diarrhea, etc) are stress related. Many have had poor nutrition and a hard life before coming to your home. ARA cannot be responsible for resident dog vet bills, we do not have the financial resources to make that commitment. If it is not possible to physically separate the dogs, try to ensure that everyone has their own “personal space” of a bed, a crate, or a special area. This will keep the stress levels lower for your own dogs and the rescued dog. The backyard is not an acceptable place to leave your new husky alone & unsupervised. They may be destructive and huskies are escape artists, they may howl incessantly, or they could be stolen. A crate or a room that is enclosed (like a kitchen) are the best choices.